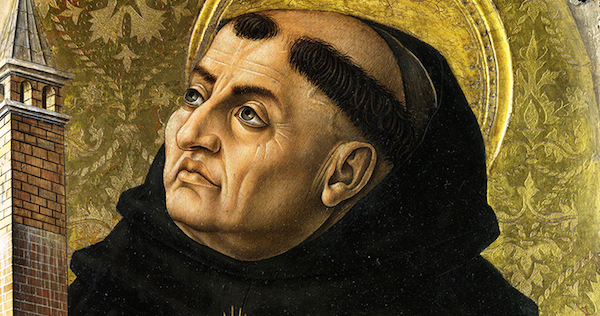 Thomas Aquinas is known for his negative theology: “We are not capable of knowing what God s, but we can know what He is not” (ST, I, 3, prologue). His negative philosophy is less well known, but Josef Pieper argues (The Silence of Saint Thomas) that this is at the heart of his entire philosophico-theological enterprise. Pieper shows that for Thomas “truth” is a quality of things, not merely a quality of propositions or thoughts. Things are “true” insofar as they are “creatively thought,” that is, insofar as they are thoughts and spoken by God: “It is essential to their nature . . . that they are thought. They are real precisely because they are thought. To put it more explicitly, they are real because they are thought creatively, that is, they have been fashioned by thought.” Citing Romano Guardini, he says that for Thomas things have the “character of a word” (51). Because things are creatively thought by God, they are capable of being known. Everything is infused with radiance and brightness from the creative mind of God, and this radiance is the thing’s self-disclosure (56). Things are known because they are created, and only so. At the same time, the fact that they are created is the source of their opaqueness. The truth of a thing is its correspondence to some perfection in God; we know it only because of this correspondence to God; but we cannot know this correspondence. As Pieper puts it, “This relation on which the truth of things is fundamentally based – the relation between natural reality and the archetypal creative thought of God – cannot, I insist, be known formally by us. We can of course know things; we cannot formally know their truth. We know the copy, but not the relation of the copy to the archetype, the correspondence between what has been designed and its first design” (59). Here is the paradox of creatureliness: “it is part of the very nature of things that their knowability cannot be wholly exhausted by any finite intellect, because these things are creatures, which means that the very element which makes them capable of being known must necessarily be at the same time the reason why things are unfathomable” (60). Early in his book, Pieper says that creation is the hidden key to Thomas’s theology, a key evident in the jaggedness of his reasoning, the jumps in logic, that can be smoothed only if we recognizing Thomas is assuming his metaphysics of creation. He finds such a jump in Thomas’s Quaestio de Veritate where Thomas backs up the statement “What is real is called true in so far as it realizes that toward which it is ordained by the mind of God” with a quotation from Avicenna. Pieper notes that we wouldn’t see Thomas’s point in Avicenna, and the fact that he does indicates that “Thomas was unable to separate the idea that things have an essence – a ‘what’ – from the other idea that this essence of things is the fruit of a designing and creative knowledge” (62-3). One of the implications of this model is that human knowing becomes an never-ending venture into realities whose richness we will never exhaust. We can’t discover the essence of a single fly. Yet we do know. Putting those two claims together, Pieper concludes that our knowledge takes the form of hope which is “the condition of man’s existence as a knowing subject, a condition that by its very nature cannot be fixed: it is neither comprehension and possession nor simply non-possession, but ‘not-yet-possession'” (69). Forever and always, “not-yet-possession,” with the knower always on the way.